This chapter takes its cue from debates surrounding the effect of digital technology upon the act (and art) of drawing to examine a landmark of digitally animated filmmaking. Produced during Pixar co-founder Ed Catmull’s tenure as a graduate student at the University of Utah, A Computer Animated Hand (1972) features a three-dimensional rotating hand rendered in pristine computer graphics. A pioneering scientific research project and a showcase for the computer’s technical potential as a tool for animation, A Computer Animated Hand places front and centre the role of “handiwork” in the construction of digital images. This chapter begins by examining the film’s production within the North American computer graphics industry, before examining the development of Ivan Sutherland’s computer drawing program “Sketchpad”. The chapter argues that A Computer Animated Hand’s spectacle of the hand recalls the formal repertoire of early animated cartoons, which repeatedly turned to the image of the “hand of the artist” (Crafton 1979) to conjure the creative possibilities of a new medium. 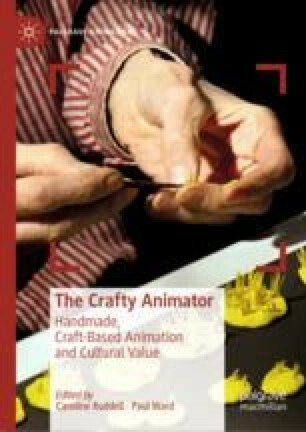 This chapter therefore explores the ways in which A Computer Animated Hand (as an early example of computer animation) sought to plot the identity of innovative digital imagery as something reassuringly handmade.